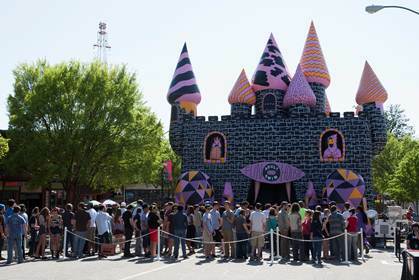 Also not to be missed, the Adult Swim Funhouse will be making its official grand opening at San Diego Comic-Con, to the delight and confusion of attendees. The magic castle will be erected across from the convention center, in the Petco Park parking lot just over the footbridge. Fans will have a chance to enter the world of Adult Swim and get lost within the 10+ rooms. The multiple paths and room challenges will force guests to crawl, dance, and sing their way to get to the end. Those fans who survive and emerge from the Adult Swim Funhouse will receive free custom live screen printed t-shirts. Free for fans, tickets will be distributed at the Funhouse each day starting at 4:00 p.m. and will be open Thursday, July 18 – Saturday, July 20 from 5:00 p.m. – 10:00 p.m. each night. Below is a schedule of series panels 2013 Comic-Con International in San Diego, Calif., Thursday, July 18 – Saturday, July 20, 2013. Panel times and room locations will be announced in the coming weeks. PREVIOUS POST Previous post: SDCC: DARK HORSE GUEST OF HONOR KAZUO KOIKE! NEXT POST Next post: CLONE WARS ANAKIN SKYWALKER TO MODERATE 5TH ANNUAL "BEHIND THE MUSIC WITH CW3RP"